I have lived this close to DC all my life and haven't ever made it to see the Cherry Blossoms.. what is wrong with me? I love the look of the blooms.. not particularly the mess afterwards, but its not mine to clean up! LOL!! I am so excited! I wanted to create the blossoms themselves.. so here is my first attempt! I used two challenges to complete the card. 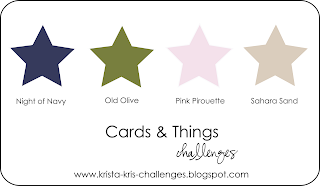 The Paper Players Sketch challenge and Card & Things Color challenge! Go ahead, see what you can do too! ﻿I am off to see the blossoms, and am hoping the rain and weather hasn't made them fall. I have been like a 6 year old all week with excitement! I guess if all else fails, I can go to the zoo! Chera, this sentiment is so perfect with the blossoms. They are gorgeous - in real life - and on this card! Fabulous take on the sketch and I love that you incorporated a color challenge, too. Really fabulous card. Sweet, creative card! I haven't seen the cherry blossoms either and I live an hour away!!! These are almost as good! Thanks for playing with us! Absolutely beautiful! Very clever and creative! Thanks for playing with The Paper Players this week! your first attempt is great, love the flowers. I love cherry blossoms too! What a cool idea and they look so real! Thanks for joining us this week at the Paper Players! Beautiful!! 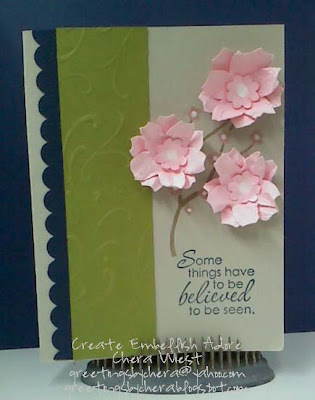 I love how you created the Cherry Blossoms - what die did you use? What a great take on the PP sketch! Stunning card!! Love the Cherry Blossoms! Thanks for joining in the color challenge on C&T!